Antarctic Climate Change All Natural? 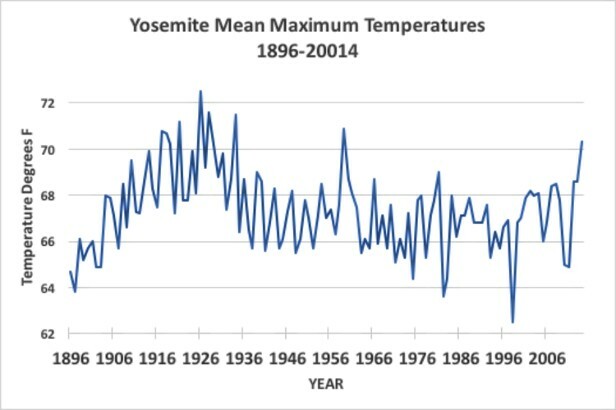 Whether you believe recent warming was natural or caused by rising CO2, warmer temperatures have promoted better growing conditions and that has been good for man and beast. During the cold Little Ice Age tree lines retreated. From the 1400s to the end of the 1800s forests thinned, especially where it was too cold for tree seedlings to establish. Since the beginning of the 20th century that trend reversed, our climate warmed and growing seasons lengthened. Indeed, more warmth can generate more wood for fires. On the other hand, along with improved agricultural efficiency, this more favorable growing climate has allowed us to feed a rapidly growing global population despite Stanford scientist Paul Ehrlich’s dire predictions we would experience mass starvation by the 1970s. The statistical rise in fires since 1970 is mostly due to changes in fire suppression policies. The debate over pros and cons of fire has a long history. Native Americans had used fire to promote favored food plants and wildlife. Fire historian Stephen Pyne noted timber owners and ranchers in California promoted the use of prescribed “light burning” in the 1880s to reduce fuels, maintain pastures and reduce the likelihood of larger more destructive fires. Small natural wildfires also created natural fire breaks and a patchy forest mosaic that reduced a fire’s ability to spread beyond a local patch. Unfortunately, a few terrifying fires led land managers to embark on a policy of complete fire suppression. The Peshtigo, Wisconsin fire of 1871 blackened 1.5 million acres and caused the deaths of 1,500 to 2,500 people. Fires threatened recently formed Yellowstone National Park in 1886, and the army was called in to fight it. Around the 1970s, some government agencies began adopting “let it burn policies” if human habitat was not threatened. An increasing use of prescribed burns attempted to reduce abnormal fuel loads and restore the natural fire balance. 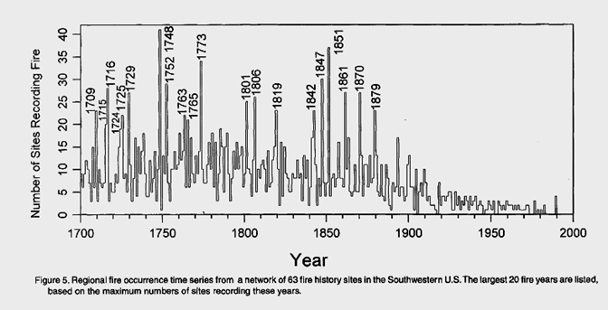 But fire ecologists still “estimated that approximately 3 to 6 times more area must be burned to restore historical fire regimes.” The unnaturally low fire frequencies of the 1980s and 90s can be seen in Figure 5 from a 1999 research paper by Dr. Swetnam. Based on fire scars of old living trees from 64 southwest study sites, fires were 5 to 15 times more numerous and widespread between 1700 and 1880 than during the 1990s. When global warming demagogues argue climate change has now resulted in 5 times more fires than observed in the 1970s, they fail to inform the public this increase is largely due to a shift away from the previous complete fire suppression policy to selectively allowing fires to burn. Not only were fires naturally more common before “global warming”, earlier fires could be huge. Newspaper articles from Tucson, Arizona reported individual fires that scorched over a million acres before 1890. Wisconsin’s Peshtigo Fire blackened 1.5 million acres in 1871 and over 3 million acres were torched in the Big Blowup (aka Great Fire of 1910). The largest fire in Canadian history was the Miramichi Fire of 1825 that burned 3 million acres in News Brunswick and extended into the state of Maine. Unfortunately, large fires are more likely today because past fire suppression has caused an unnatural build up fuels. Fires are more likely during droughts. So, demagogues blame a “dire global warming-fueled trend” for increasing droughts and thus fires. But regional temperature trends usually differ from the global average statistic. For example, the western Arctic was cooling in the 80s and early 90s until shifting winds removed thick insulating ice into the warmer Atlantic, allowing stored subsurface heat to more readily ventilate. Arctic temperatures then rose twice as fast as the global average. In contrast, the eastern half of Antarctica has not warmed at all. The misleading use of a global average statistic reminds me of an old joke. A man got his head stuck in a hot oven. While trying to extricate himself he got his feet stuck in the freezer. Not knowing what to do, his wife summoned a doctor hoping he could ease her husband’s pain. But after a careful examination, the doctor concluded her husband was just fine. On average, his body temperature was perfectly normal. In contrast to the global average, the southeastern USA has not warmed since 1900. The illustration below is from a 2017 research paper Timing and Seasonality of the United States ‘Warming Hole’. It shows summer temperatures cooled by about 1°C from 1930-1950. While warmth in the northern USA began to recover from 1950 to 1975, the southeast remained cool. Despite some recent warming, as of 2005 temperatures in much of the southeast are still slightly cooler than 1901. In 2016, devastating fires burned over 100,000 acres across 7 states of southeastern USA. The Public Broadcasting System’s PBS Newshour hyped the fires with the headline “How Big Droughts and Forest Fires Can Become the New Normal in Appalachia”. They interviewed U.S. Forest Service ecologist James Vose who stated, “It’s very rare to have this many fires burning this amount of area in the Southeast.” But before extensive logging, the Southeast was dominated by the Longleaf Pine, a fire-adapted tree that depends on frequent fires to remove competing vegetation. Its widespread dominance could only be maintained by frequent forest fires. And with no warming trend since 1900, Appalachia’s “old normal” was likely no different than the “new normal”. Extreme swings between wet and dry years, driven by El Niños and La Niñas, are exactly what natural climate change predicts. Periodic La Niñas induce droughts that amplify the effects of California’s annual summer drought and cause anomalously high temperatures. El Niños induce greater winter rainfall and more growth, that then serves as fuel for the next dry fire-season. There is no consensus among climate scientists regards the effects of increasing CO2 on the strength and frequency of El Niño events. Some models indicate more La Niña-like conditions. Some models indicate more El Niño-like conditions. Tree rings suggest no trend since the 1300s. Most likely periodic droughts and high fire risks will always be a fact of life, exactly as natural climate change predicts. It is worth noting the only “evidence” scientists have that the earth’s changing climate has been driven by rising CO2 is based on their models’ failures to simulate 20th century warming when only “known” natural factors are considered. When increasing CO2 is added, their models can simulate average global warming since the 1970s. But their models fail to simulate earlier oscillating weather patterns. So, there is a high likelihood climate models have failed to incorporate some critical natural factors affecting climate change. For example, the natural Pacific Decadal Oscillation (PDO) results in 20 to 30-year periods of more frequent El Niños, which alternate with periods of more La Niña’s. The negative phase of the PDO amplifies the impacts of La Nina droughts and increases the risk of fires from California to the Colorado Rockies to southeastern USA. Yet the PDO was not even named until 1997 and is still not accurately incorporated into global climate models. In 2014, the scientist who discovered the PDO co-authored a research paper demonstrating how the PDO explained observed climate swings along much of west coast North America. The impact of the PDO was highly significant but contributions from greenhouse gases were insignificant. 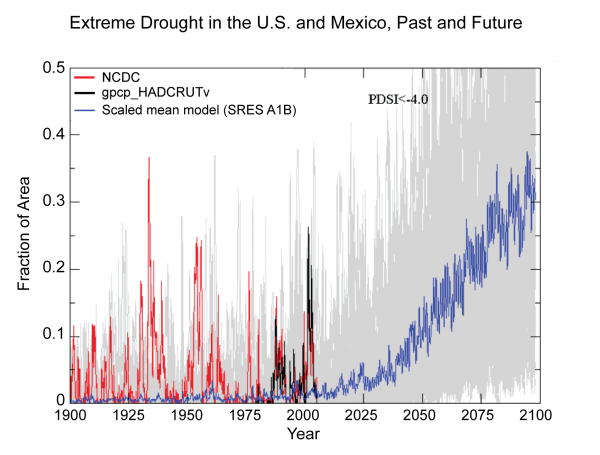 As illustrated below in a graph highlighted in a past National Climate Assessment, CO2 driven climate models failed to replicate the extent and severity of observed droughts since 1900. The number on the left axis represent the proportion of the USA and Mexico that was in drought. The red and black lines represent actual observations. During the Dust Bowl years 20% to 35% of the USA and Mexico were in extreme drought. Gray lines represent the scatter of individual models. The blue line represents averaged model results, which project that as CO2 rises we’ll experience growing widespread catastrophic droughts in the 21st century. That catastrophic projection is what the media hypes. But should we trust dire future predictions from models that totally failed to simulate the extreme droughts of the 20th century. Would you trust a doctor’s diagnosis, if he failed to correctly diagnose his previous patients?